Zach Beaulieu, Illinois wheelchair basketball player. Wataru Horie, a player from Japan, grimaces and laughs with his teammates after falling over in his chair at practice. Frequently, players lose control of their chairs and fall, roll, or flip, but they can quickly push themselves up again and resume playing. After playing two games in a row at a University of Wisconsin-Whitewater tournament, Denny Muha's hands show calluses, peeling skin, and caked-on dirt. His hands get so dirty from pushing his wheelchair so much. "Some courts are dirtier than others," Muha remarked. Head coach Mike Frogley talks to players during practice. "He knows when to yell and when to praise," Brandon Wagner said. "He always seems to know the right call, in practice or in a game." Brandon Wagner, left, tries to intercept Drew Dokos' shot while Matt Buchi tries to lift himself up. "The smallest guy on the court can keep the biggest, fastest guy out of the court just by having good chair position," head coach Mike Frogley said. "A pick and roll in wheelchair basketball is the most deadly way to score." Wataru Horie sprints during practice as part of a warm-up exercise. Every practice is comprised of a warm-up, stretching, exercises, and then a scrimmage. Denny Muha reaches down to pick up a pencil during his class at the University of Illinois at Urbana-Champaign. Muha got his B.S. in Recreation, Sport, and Tourism, and his Master's in Human Resource Management. Denny Muha lifts his wheel into his car after practice. In order to get into the car, he has to sit in the driver's seat, then dismantle the chair into pieces and put it into the back seat. Denny Muha and Amanda McGrory shop for food at Wal-Mart. Because Denny and Amanda are both in wheelchairs, "it's easier to deal with any disability-related issues," Muha said. "I think it's easier because there's less to explain." Denny kisses Amanda during a party for team member Matt Buchi's 21st birthday. At this point, they had been together for a year-and-a-half. Matt Buchi dances with women's track athlete Jessica Galli at Joe's Brewery in Champaign, Ill., for a night out to celebrate his 21st birthday. Despite the difficulty of getting into crowded bars, they still go. Wataru Horie, center, and Lars Spenger unload the bus after returning from a tournament. To ward off boredom on a bus trip, from right, Alex Grunstein, Steve Serio. and trainer Karla Wessels play cards; from left, Lars Spenger, Aaron Pike, and Brian Bell watch video on a laptop; and Drew Dokos, in the back, reads. From left, Paul Ward, Brandon Wagner, Matt Buchi, and Edina Mueller push their game chairs through the snow on their way to a tournament at Edinboro University. Each athlete typically carries two chairs and spare wheels with them to every tournament. They don't have much traction with the uneven, snowy surface. From left, Steve Serio, Brandon Wagner, Brian Sheehan, and Matt Buchi eat dinner together at Perkins Family Restaurant after an Edinboro University tournament. 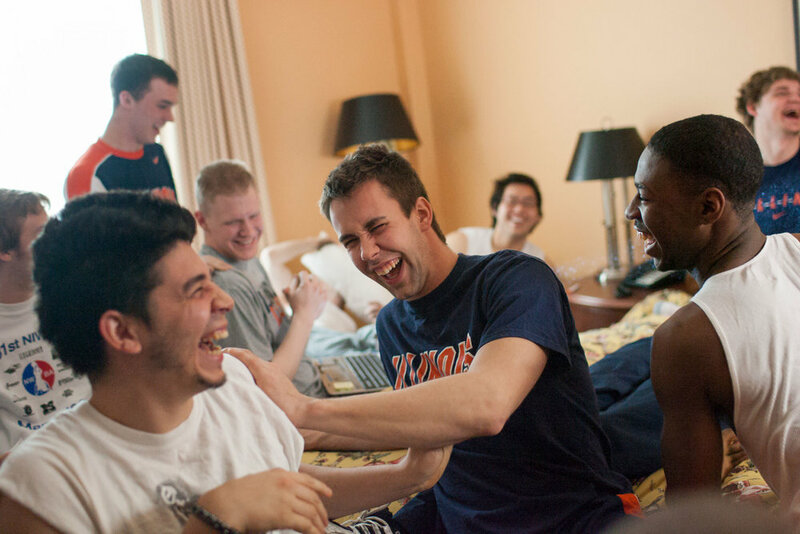 From left, in front, Jaime Baltazar, Aaron Pike, and Brian Bell laugh together with teammates during a team meeting at their hotel. "Off the court, they really interact with each other really well," head coach Mike Frogley said. "And that's good — in the long run, that'll help them on the court." Josh George, left, and Lars Spenger watch video of a previous game against Edinboro University in head coach Mike Frogley's hotel room. They regularly study past games to learn from mistakes and improve. Steve Serio fixes his hair while sitting atop a counter at his hotel after a wheelchair basketball tournament. Since he could not jump into the pool on his own accord due to paralysis below the waist, player Joey Gugliotta set himself up on a table, while friends Brian Bell and Tom Smurr held it down so he could fall into the pool at their hotel. "I've never jumped into a pool before," Gugliotta said. He also tried falling in while sitting in a chair. Players roll across the Oklahoma State University campus to the first match of the National Intercollegiate Basketball Tournament (NIWBT). Players practice in the gym at Oklahoma State University as head coach Mike Frogley watches. The team beat Mizzou the day before, 28-4, and was preparing to face Arizona. They ended up beating Arizona, 31-17, to advance to the championship game. The Illini were the No. 1 seed going into the tournament, but they were still considered the underdog to the Wisconsin-Whitewater Warhawks, who have won the championship four of the past five years. Brian Bell gets ready for the championship game of the NIWBT on March 15, 2008. From left, Brian Bell, Joey Gugliotta, Jaime Baltazar and Lars Spenger practice shooting before the championship game against Wisconsin-Whitewater at the 2008 NIWBT. Head coach Mike Frogley yells about an intentional foul from a Wisconsin-Whitewater player during the championship game. 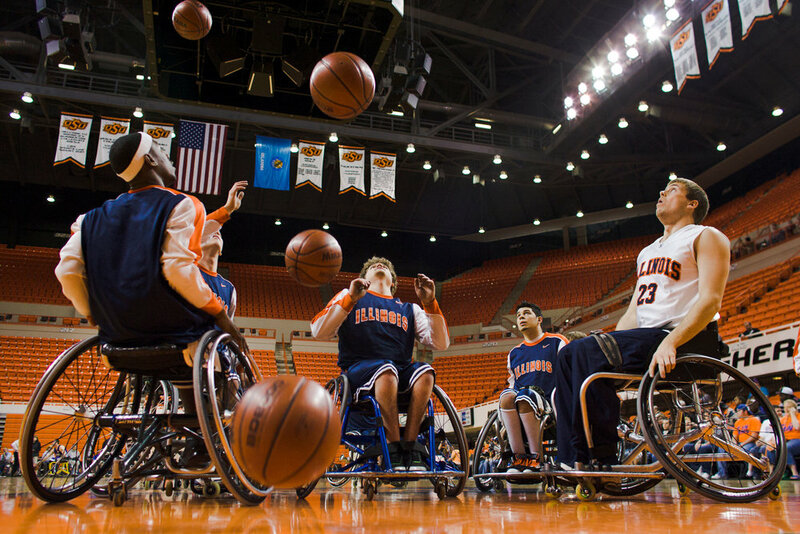 From left, Joey Gugliotta, Matt Buchi, Tom Smurr, and Lars Spenger celebrate after Illinois defeated Wisconsin-Whitewater, 63-58, to win the 2008 National Intercollegiate Wheelchair Basketball Tournament championship. Drew Dokos celebrates the team's win atop the basket. The championship title was the first for the Illini men since 2001. It was also the first time since 1990 that both the Illini men and women have claimed titles. Tom Smurr and Jaime Balthazar proceed down the hallway of their hotel later that night. Peter Won raises a single fingers to celebrate the Illiniois men's wheelchair basketball team's championship title as they head back to Illinois.